MB got back home during the week and found to her delight that the monsoon has moved on, the southerlies are blowing, humidity has dropped dramatically and nights are cooling. 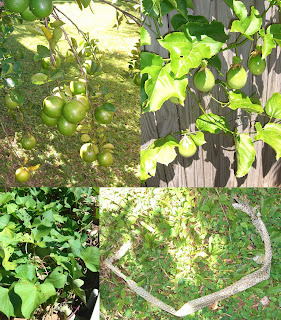 Cairns is emerald green, has water galore and the MB family garden is showing off it's bounty. The lemonade tree, a lemon & orange cross, is bursting with fruit, the first year it has produced anything of significance. MB's Panama Red passionfruit which wasn't even flowering in March is now laden with fruit and the sweet potatoes are growing like trifids and continually need cutting back. Yes that's yet another snake skin, noticed this skin today just lying on the grass under the lemonade tree. The juice from the lemonade fruit is superb and does really taste just like it's name!